This chalet style house sits on a shale bluff above Lake Champlain. The property has 100 feet of lake frontage. A lower deck and stairway go down to the water. Water depth is gradual, which makes it very safe for young children. The location, Porter’s Point, is very quiet and appealing. The location is on the outer bay of Malletts Bay, which is a 15 minute drive to downtown Burlington. The Lake Champlain Bike trail is around the corner, no more than a 5 minute bike ride away. In addition, The Lake Champlain Paddle Trail is located nearby. Swimming and boating from the property are excellent. There is a boat mooring with the property. The best fishing in Lake Champlain is just minutes away in the broad lake. If you are a diver you cannot find a better location. For winter renters, the ski areas are between 40 minutes and 1 hour and 30 minutes away. The most easily accessed areas are Bolton Valley (40 min), Stowe(1:20) and Sugarbush(1:20). Smuggler’s and Jay Pike are also an easy 1 to 1:30 drive. The house has a total of 2300 sq feet. It contains 3 bedrooms and 1 and a half bathrooms. Two bedrooms have a queen sized bed and the third bedroom has a double bed. The open floor plan contains a living room area with a fireplace and a dining area. There is an eating bar in the modern kitchen that seats six. There is a wrap around outside deck with fantastic views, especially of the sunsets over the Adirondacks and Lake Champlain. The deck is fully furnished with chairs, an eating table and awnings. The house is fully furnished and all linens and kitchen utensils are in place. The house has a full central heating system. There is an upstairs loft area that contains an office space, a couch that folds out to a double bed and a living room area. The house is equipped with two TV sets with cable service. In addition there is high speed internet access in the office space in the loft. The telephone has unlimited US long distance service. There is a laundry room with washer and dryer. The water system is town water and the house is on a newly installed septic system. No pets and no smoking. The house comes with a canoe, sit on top kayak and two bicycles. Snow plowing, in winter, is included. The rent is $1800 for the week which begins at noon on a Friday and ends at noon on the following Friday. (There is flexibility around this!). In addition, a $500 deposit is required to confirm the booking. This will be refunded at the completion of the rental. There is also an additional $100 cleaning fee. We are willing to discuss longer term rentals. 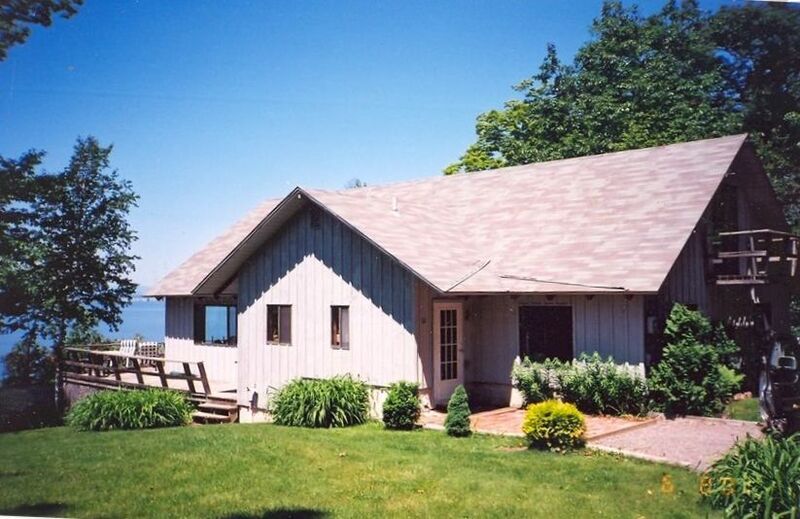 Year round weekly rental of waterfront deck house on Lake Champlain. This property is managed by a professional property manager. You can tell the owners love and take good care of this charming lake house. It is impeccably clean and full of good vibes. The sliders and deck facing the lake provide a gorgeous view of Champlain and of the distant mountains. It has plenty of common area space, but at the same time it is cozy and intimate. This rustic home is ideal for families with children of any age, and for close friends. I highly recommend this property for people who enjoy nature and who enjoy each other. Comfortable lake front home with great western views. My family and I spent a great Thanksgiving weekend. Great location. The house is located directly on the lake which was breath taking. The location was amazing and the owners were wonderful to communicate with. The house was clean and were are looking forward to coming back in warmer weather. We always welcome folks like this to our home at Porters Point! We loved this house! Beautiful views, easy access for the Burlington bike path, quiet, lovely neighborhood and the kayaks, grill and beach toys made for a great week. Don was a pleasure to work with and very responsive. We’ll be back. Many thanks , Michele. You and family will always be welcome...we are thankful when folks take such good care of the house. Wonderful home in an ideal lakeside location. Beautiful sunsets and nature views. Cozy, clean and welcoming home. Perfect getaway. It is always wonderful to have such nice, appreciative folks as guests at the house. These are the very best we have had! Looking forward to their return.